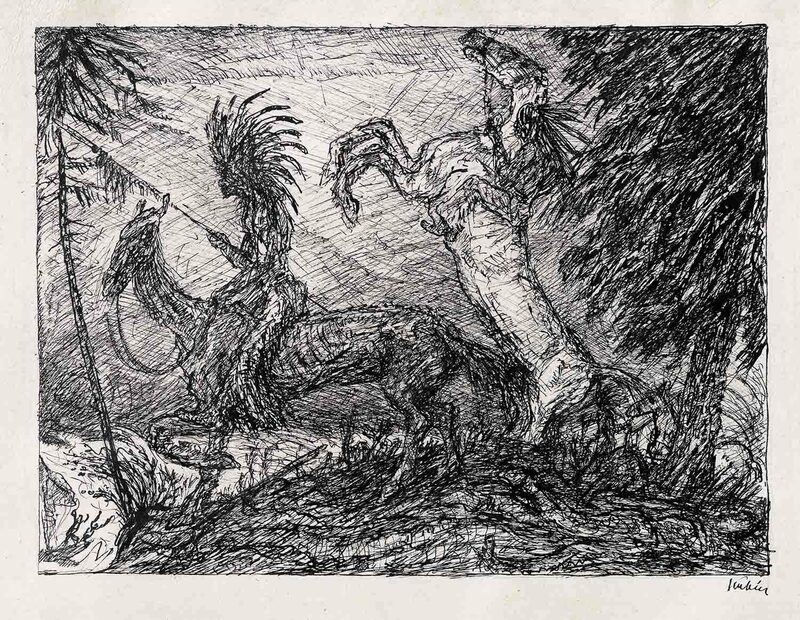 Alfred Kubin’s numerous illustrations and drawings as well as his literary works are characterized by fantastic, eerie and symbolically charged dream visions. His narrative pictorial compositions reflect fears and desires that are deeply rooted in the subconscious and that he renders with characteristic, dense networks of lines, hatchings and fluent transitions between the forms. Kubin’s depictions are mostly the result of various earlier pictorial experiences, and he deliberately merges the history of art and literature, experiences of everyday life and observations of nature. Although Kubin led a secluded life in Zwickledt near Wernstein am Inn (Upper Austria), his work was among the most often exhibited by artists of his time. As the only Austrian member of Der Blaue Reiter (“The Blue Rider”) group of artists, he knew many prominent personalities, including Franz Marc, Paul Klee and Hermann Hesse. He collected and studied works by artists such as Goya, Munch, Ensor, Redon, Rops and Klinger, subsequently developing his unique, personal style.